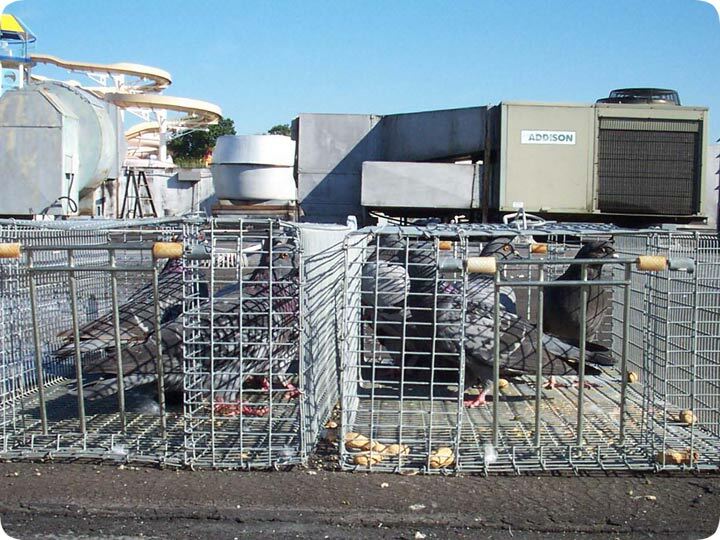 02.04.2004 - This is an example of an urban pigeon removal job that I performed at a water park here in Orlando FL. You can see the water slides in the background of this photo. The water park, Wet-N-Wild, was concerned about the presence of pigeons in the park. They were a constant nuisance - not only flocking around the park and eating scraps left by park visitors, but most of all, nesting on the buildings and leaving behind nesting debris, feathers, and of course, the big problem - pigeon droppings. The droppings were unsightly and unsanitary. Pigeon poop is the primary complaint of urban bird problems, and a lot of work goes into pigeon control. The water park had already installed bird spikes to deter the pigeons from roosting on most of the more desirable areas in the park, but pigeons remained in many areas. The park wanted to simply limit the number of pigeons present in the park. Thus, I was called in to decrease the pigeon population via a program of trapping and removal. Over a period of months, I was able to trap hundreds of pigeons and remove them, thus decreasing much of the pigeon problem in the area. I got paid about $1/hour for my efforts.